Youngster Ben Baker was the late hero for Kettering Town as they beat Corby Town 2-1 in the first round of the NFA Hillier Senior Cup at Latimer Park. As expected, both clubs fielded a mix of first-team, fringe and youth players for the tie ahead of FA Cup matches at the weekend. And the Poppies struck first when Jevani Brown opened the scoring after just two minutes. 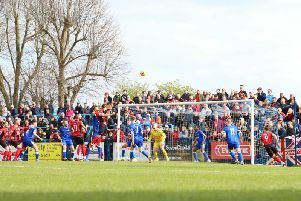 Jamie McAlindon saved well from Kabongo Tshimanga while Saul Williams went close to doubling the home side’s advantage. Ashley Sammons had an effort ruled out for offside and was then denied by McAlindon. But Sammons did bring the Steelmen level early in the second half after Dubi Ogbonna had headed wide for the Poppies. Williams shot off target but Kettering did grab the winner with five minutes to go through 16-year-old Baker who is part of the club’s under-21 squad. Corby did go close to an equaliser as Kurtis Revan having the ball in the net, only for the game to be pulled back for a foul while McAlindon saved from substitute Spencer Weir-Daley in stoppage-time. Elsewhere in the Hillier Cup, Craig Adams’ first game back in charge of Wellingborough Town ended in a penalty shoot-out defeat against ChromaSport & Trophies United Counties League Premier Division rivals Desborough Town at the Waterworks Field. Mark Pryor gave Wellingborough the lead in the second half only for Jake Bettles to equalise with 14 minutes to go. And it was Ar Tarn who prevailed 4-2 on penalties. Rothwell Corinthians’ tie with Peterborough Northern Star was abandoned with the visitors 1-0 up due to a serious injury to a Corinthians player. In the UCL itself, Division One leaders Stewarts & Lloyds came from 2-0 down to draw 2-2 at Bourne Town. In the Knockout Cup, Raunds Town suffered a 2-0 home defeat to Yaxley, Irchester United went down 4-1 at Oadby Town and Burton Park Wanderers lost 4-0 at Peterborough Sports.